PROVIDENCE -- The man who spends his evenings on cable TV instigating political squabbles and shouting matches over sometimes petty partisan issues says the United States should have "a Great Debate" about "big ideas" the 2004 presidential election. "I want a big debate, I want a great debate," Chris Matthews, host of the MSNBC political show "Hardball," told about 200 students at Brown University's Sayles Hall Monday morning. "I want this country to have a shattering, explosive presidential campaign." He predicted that if such a debate happens, it will be about Iraq. "The 2004 campaign will be and should be fought on the issue of the war," Matthews suggested, noting, "presidential politics are driven by foreign policy failures." To back up that statement, Matthews pointed to President Harry Truman deciding against running for another term in 1952 because he was "bogged down" in the Korean War, and Republican Dwight D. Eisenhower, the general who helped beat the Nazis in World War II winning that election on the promise "I will go to Korea." President Lyndon B. Johnson similarly dropped out of his final campaign, he noted, because of the Vietnam War. And Jimmy Carter, the president Matthews worked for as a speechwriter, lost his bid for a second term because of the Iran hostage crisis. "Of the last 10 presidents, five were unsuccessful," he said, and in three of those cases it was because they were entangled in unpopular foreign policy crises. Speaking just moments before Boston Red Sox manager Grady Little was fired, in part for leaving Pedro Martinez in the game during the seventh game of the New York Yankees pennant series, Matthews said American voters are like managers who come in and pull pitchers out of the game. The same is true for presidents. If they guy can't get the job done, Matthews contends, "the voters say 'He's out of here.'" You might not be able to tell from the hard time he gives them on his TV show, but Matthews says he likes and respects politicians. "What I like about politicians and why I respect them more than news people or people like me," he said, "is that it takes a tremendous amount of guts to stick your neck out in a world where the odds are overwhelming that you will get humiliated, personally. That the other side will find something on you, that they will laugh at you for losing." Matthews acknowledged that his personal favorite in the race is Howard Dean, the former Vermont governor who many see as the Democratic front-runner. "He came out of Vermont, a small state, with no foreign policy experience and with sheer guts he believed in one big idea and that big idea was: 'It was wrong to go around to the other side of the world to fight a war.'" The problem for Dean, the former aide to House Speaker Thomas P. "Tip" O'Neill of Massachusetts, Matthews said, is the American people have to decide, "do you put a lefty in at a time of crisis?" 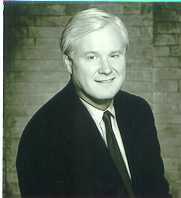 Seldom shy about his opinions, Matthews said the Bush administration's rationale for going to war in Iraq was "nonsense" and totally dishonest. He laid most of the blame at the door of Vice President Richard Cheney. "Cheney is behind it all," the former newspaper reporter and columnist said. "The whole neo-conservative power vortex, it all goes through his office. He has become the chief executive. He's not the chief operating officer, he's running the place. It's scary." Matthews painted Cheney as the guy "who put his thumb on the scale" to affect the balance between Secretary of State Colin Powell and Secretary of Defense Donald Rumsfeld. "The ideologues started circling around the president," Matthews said, warming to his topic. "They saw a man who never read any books, who didn't think too deeply and they gave him something to think about for the first time in his life. This thing called pre-emption, the Bush Doctrine. They put it in his head and said 'Iraq, Iraq, Iraq.'" Nonetheless, Bush has some "clear strengths" and Matthews says "coming into the election, he is still the favorite." He said Bush had a "King Arthur moment" when he stood on the rubble of the World Trade Center with a bullhorn and pledged that "'the people who knocked these buildings down are going to hear from all of us.' He pulled the sword out of the stone." Thanks Chris, You'de da man. Boston Herald Headlines today. "Its a Rout". They pictured Kerry and Dean. Dean has 42% poll rating and Kerry is 12%. In terms of Peace Corps legislation, Kerry has had alot of years to put something on the table. He is the third ranking member on the Foreign Relations Committee. He proposes thousands more volunteers. How about a quality program John? How about helping families from Massachusetts who have had problems with the agency? There is no response. His response over the years, on alot of issues are being scrutinized and people are making up there own minds. As for Volunteer Safety, Security and Attrition Rates of Volunteers, he is the status quo and the people are speaking. What I like about politicians and why I respect them more than news people or people like me," he said, "is that it takes a tremendous amount of guts to stick your neck out in a world where the odds are overwhelming that you will get humiliated, personally. That the other side will find something on you, that they will laugh at you for losing." I have run and I lost. What's really not that funny is the one's who usually laugh or are the negative ones, don't vote.